Peppermint essential oil is steam distilled from Mentha piperita, a flowering perennial herb that grows prolifically wherever it is planted. This oil is said to be beneficial for acne, dermatitis, eczema, headaches, insect bites, mental fatigue and migraines. Has anti-depressant, anti-septic, astringent and insect repelling properties. Very often used as a fragrance component in handmade soaps. 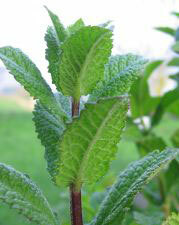 Has a pale yellow color and has a strong, sharp, fresh mint scent. Avoid during pregnancy and may cause skin sensitization in some individuals. Blends nicely with other herbal oils, citrus oils as well as bergamot, benzoin, black pepper, cedarwood, eucalyptus, geranium, juniper, lavender, pine and tea tree.